GuocoLand has been active in China since 1994 and is an established property developer in China having developed a sizeable portfolio of properties in Beijing, Shanghai, Nanjing and Tianjin. 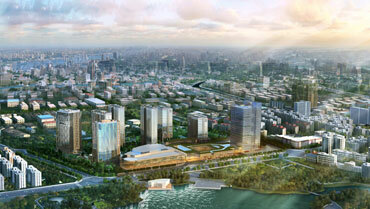 Shanghai Guoson Centre is strategically located at the Changfeng Ecology Commercial District. With approximately 500,000 square metres of gross floor area, this development comprises retail, office towers, Small office, Home office (“SoHo”) units, hotel and service apartments. The 354 SoHo units and an office block have been sold. Hongqiao integrated transportation hub, just 10 minutes’ drive away, offers connectivity via express rails to other cities including Hangzhou, Nanjing and Beijing. Company Registration No: 197600660W. All rights reserved.